BRUSSELS, Belgium -- The European Union set conditions Monday for Ukraine to win visa-free travel rights for its citizens while urging Kiev to make progress on human rights. 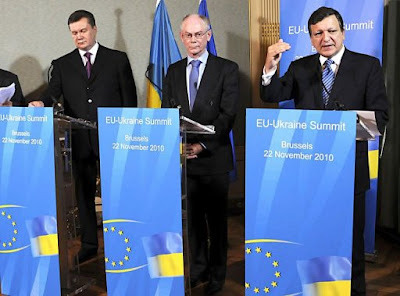 Viktor Yanukovych (L), Herman Van Rompuy (C) and Jose Manuel Barroso. The two sides agreed on an "action plan" at a Brussels summit between Ukrainian President Viktor Yanukovych, European Commission chief Jose Manuel Barroso and EU president Herman Van Rompuy. The roadmap urges Kiev to make major improvements in border control, migration and asylum policies, and the protection of travel documents to prevent forgeries. "Let me reassure you of our commitment and support for building closer and ever friendly ties with your country," Barroso told Yanukovych during the meeting. The head of the EU's executive arm reiterated European concerns about rights in Ukraine, saying the "pace and depth of this rapprochement" would depend on Kiev upholding EU principles on democracy and the rule of law. "We will work towards a deep and comprehensive free trade area. It will encompass increased mobility with the goal of establishing a visa-free regime," Barroso said. "And I'm very pleased that we have agreed that we are launching an action plan for Ukraine towards establishment of a visa-free regime for short-stay travel," he said. Ukraine and the 27-nation bloc could also seal an association agreement by the middle of next year, Barroso said. Van Rompuy said that such associations were not only economic but also "political." "As our relationship is based on shared values, the quality and the depths of it is directly linked to the quality of democracy and reforms in Ukraine. And the European Union stands ready to support Ukraine in her reforms," he said. Removing visa barriers for its citizens is one of the main objectives of Ukraine's government, which also wants to seal a free trade deal with the EU and eventually join the bloc. Yanukovych is considered close to Russia but has made overtures towards the EU, making Brussels his first destination abroad in March following his election victory. Ukraine had hoped it would secure a quicker route towards visa liberalisation, an EU source said. EU states, however, have become suspicious of opening their borders to eastern nations after being inundated by a wave of phoney asylum requests from Balkan nations that won visa-free travel rights.